Monty, the mad Moorhen came into our lives a little over a 2 months ago. My wife and I have an Oceanside Villa in Puerto Armuelles on the far Western edge of Panama, close to the Costa Rican border. 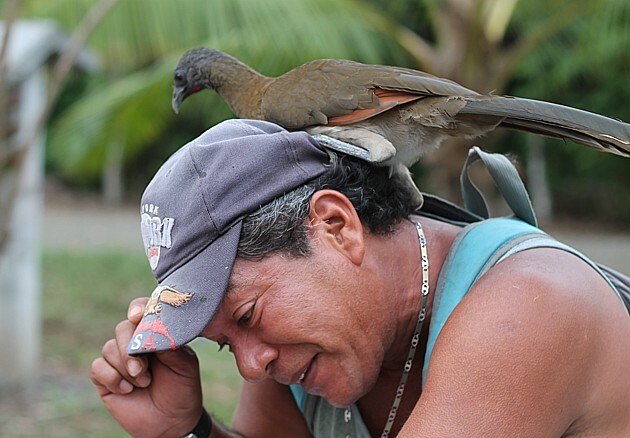 We employ two local Panamanian workers to do some gardening and odd jobs around the house. Rufo, A 59-year old from the village of Corazon de Jesus, reported a strange event one morning in mid February as he cycled to work. 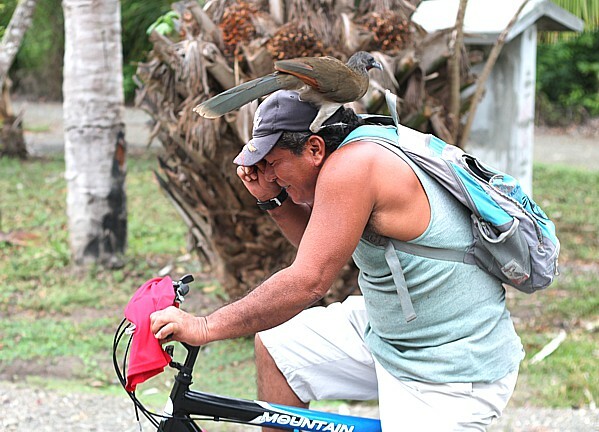 As he approached our home a medium sized bird, gently landed on his arm and then fluttered up and perched itself on his head. It was hard to understand exactly what happened as I do not speak fluent Spanish and Rufo’s English is almost nonexistent. The gist of it was that he didn’t think the bird was “mal” or bad, just overly friendly. This bird who we later named “Monty” became a frequent flyer onto Rufo’s arm and head. The problem was Monty has talons or claws about the size of a small hen and he would dig into the hair or hat of anyone he landed on quite firmly. My first close encounter with Monty came while gardening. 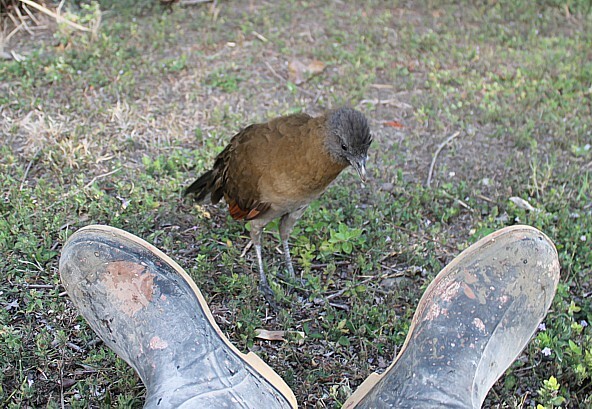 He walked right up to me and started eating my wellington boots. 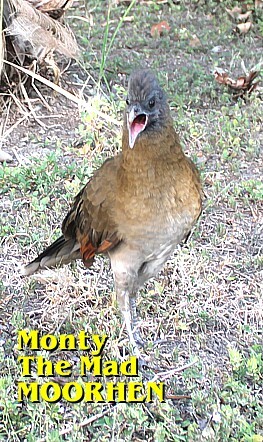 By April of this year Monty would appear as soon as I drove up in my car - almost greeting me like a dog. He would even run-again almost dog-like- behind the car and be waiting for me as I exited. He didn’t seem frightened and appeared as if complaining about something. “Perhaps he’s hungry?” I ventured to my wife Lydia. So I cut up some thin strips of ham slices and fed him. These he snatched greedily from my fingers. Noting the weird likenesses to dog-like behaviour we even put out a dog bowl with water in it. At first Monty would only land on Rufo’s black curly hair. I thought this was because it resembled in someway a nest. No! This last week he seems to prefer sun-bleached blonde hair. The first time he landed on my head it was quite painful. Obviously, not wanting to fall off, he dug his claws deep into my scalp. I yelled for help as I ran frantically around the garden trying uselessly to brush this chicken sized fowl off my head. Ivan, my other worker plucked Monty off my head and held him tightly and even started stroking him. Twit that I am, I still didn’t learn to wear my hat. On Thursday of this week Monty landed on my thinning sun- bleached hair and dug his claws in deep. I ran into my house –thinking foolishly that once indoors he would give up and fly off. No, he clung on for dear life and I ran through the living room, kitchen and out onto the south patio still wearing a Moorhen on my head. My wife Lydia and our two workers were absolutely useless, they thought this was great afternoon entertainment. Meanwhile I (still attired with fluttering fowl head dress) frantically looked for something to fend off this errant bird. There in the corner of the patio was a floor mop. This I grabbed and I proceeded to whack myself over the head several times until Monty un-headed me – unfazed, Monty simply left my head and sat, comfortably, on top of the mop. Ah! But the mop was not to his liking, his perch of preference was close by and he promptly flew back onto my head. This was getting tiresome. Once again I resorted to hitting myself over the head with the mop. Eventually both the mop and Monty made an ungainly descent down from the patio into the flower bed. If you liked this story from Panama you may want to read some other stories. To avoid Spam and Bots please copy and paste this email address. is a NEW feature. 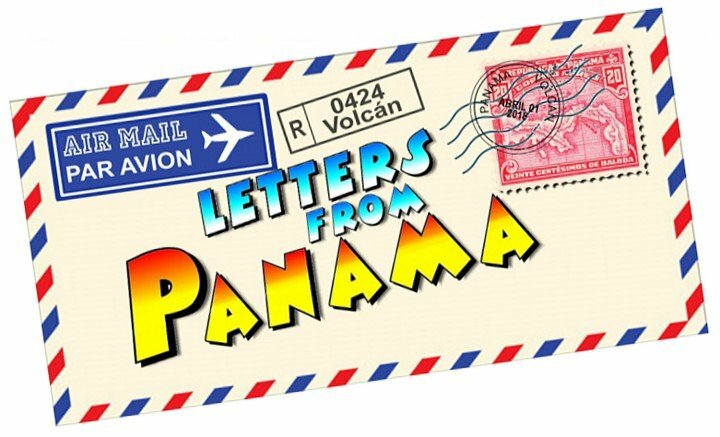 We will send out a newsletter with general information about life here in Panama. We will always try to make it amusing and lighthearted. There is a sign up box at the bottom of the page. The common moorhen (Gallinula chloropus) (also known as the waterhen and as the swamp chicken) is a bird species in the family Rallidae. It is distributed across many parts of the Old World.